The Detroit Red Wings have avoided arbitration with goalie Petr Mrazek and have signed him to a two-year contract worth a reported average annual value of $4 million. 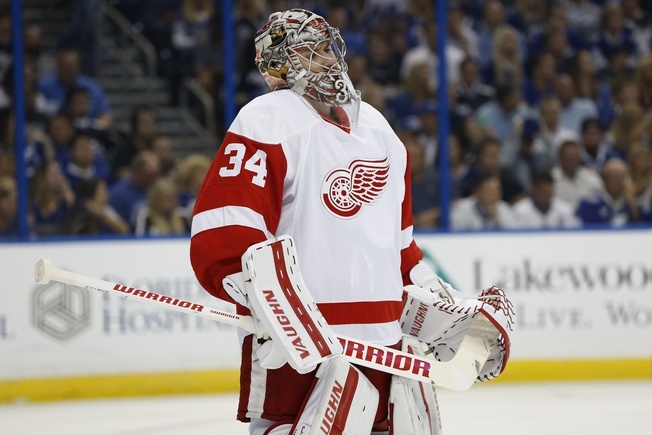 Mrazek was scheduled for an arbitration hearing on July 27, but the two sides came together to hammer out the deal a few hours before the proceedings were set to begin. The 24-year-old Czech netminder saw action in 54 games in the 2015-2016 season, picking up 27 wins and posting a 2.33 goals against average with a .921 save percentage. He had four shutouts. Mrazek was reportedly looking for more money than the Red Wings were willing to give, with some suggesting he was looking at the two-year, $10 million range. According to Sportsnet, Detroit countered with a two-year deal worth about half that. Somehow, the two sides came together and reached a reasonable conclusion. The new deal still gives Mrazek a considerable upgrade, who made $737,500 last season. He spent a big chunk of the year as the starter, until Jimmy Howard moved back into the spotlight down the stretch. The signing of Mrazek means the Red Wings have solved their restricted free agent problems, but it also means the Red Wings are over the salary cap by about $4,867,042. The most immediate solution before the puck drops on 2016-2017 will be to put Johan Franzen and Joe Vitale on long-term injured reserve. The signing of Mrazek also means that Detroit has established the netminder as their man. They’ve tried to trade Howard in the past and may return to the well to try again, especially if a viable option opens up in the market.